Intraoperative navigation is becoming more and more popular with the advent of minimally invasive spinal surgery. Whilst uptake of the technology is limited by start-up costs, it can potentially benefit screw placement accuracy and rates of surgical revision. Charles H Crawford III, Patrick Hahn, Stefan Renaud and Nicholas Haden speak to Spinal News International about intraoperative navigation for spinal surgery, investigating some of the technology on the market. What are the benefits of surgical navigation systems for spinal surgery? Charles Crawford: I think it allows us to be more accurate with our spinal instrumentation leading to increased confidence. This allows us to concentrate on other parts of the surgery. Overall, this kind of technology allows us to do complicated surgeries more safely. Stefan Renaud: There have been multiple studies showing that intraoperative imaging improves accuracy of spinal hardware placement—navigation is the next step in that evolution. For instance, fluoroscopically-assisted pedicle screw placement has been reported at 85% accuracy, whilst navigation has achieved 95% and higher accuracy rates. Also, as we use more imaging for surgical accuracy and to allow more tissue sparing techniques, radiation becomes a concern for the doctor, operating room staff, and the patient. Navigation again helps to minimise exposure to radiation. Nicholas Haden: I see navigation in spinal surgery as a major benefit whenever enhanced detail of the anatomy would be helpful to the surgeon. It does not replace the use of a “map”—I still follow the apparent anatomy—but it is good to have a “satnav” to reinforce your interpretation, and to allow you to make difficult journeys you would not consider without that support. Many surgeons who are not yet using navigation perceive its use to be only for the improved placement of pedicle screws, particularly percutaneous screws. I think what navigation brings to the table is so much more than that. It does enhance instrumentation accuracy, and with intraoperative imaging allows confirmatory imaging at completion whilst still on the table, but in my practice I have found many more advantages. A minimally invasive practice lends itself to high radiation, the long-term consequences of which are a concern for us all. Intraoperative imaging with an Arcadis (Siemens) system involves relatively low radiation for the patient and effectively zero for the surgical team. Gone are the days of hours in lead aprons! Patrick Hahn: The correct position of pedicle screws ensures a good pullout strength in the bone, a good control of rotation and the possibility of repositioning the respective vertebral body. Faulty positioning can lead to injury to neural structures, the chest and the abdominal region, and poses an increased risk of instability. Accuracy in positioning the screws is therefore of the utmost importance. In literature, the rate of faulty screw positions is reported to be 10% to 40%, with the rate of required revision up to 6.6%. To achieve an optimal position of the pedicle screw without injuring the walls of the pedicle, it is necessary to select the correct point of insertion of the screw into the vertebra, the correct spatial placement of the screw through the pedicle, and a perfect screw diameter-to-pedicle diameter fit. This is important in critical regions such as the upper cervical spine, the cervicothoracic or upper thoracic region, and can be improved with navigation. Another scope of application for navigation is the partial or complete resection of vertebral bodies or pathological changes, as critical structures can be deliberately spared here. Navigation can take place in real-time using preoperative imaging, or with data obtained intraoperatively. With good technique, it is possible to minimise radiation to the patient, surgeon and technicians. Nicholas Haden: I am convinced that navigation is a part of the future of spinal surgery. The more surgeons who use it, the quicker we will learn where it is advantageous and what are the pros and cons of its use, as well as identify areas for development. Encouraging early adopters is never a problem, but supporting those surgeons starting to use it in the future during their learning curve will be most enhanced by visitation and mentorship programmes. What are the main problems associated with the use of this technology? Charles Crawford: There are two types of errors that can happen with these systems. Sometimes, there are computer errors, which are extremely rare. These systems are machines and—just like every computer or machine—they can have maintenance or software issues. There is also the possibility for user error, and I think that is the biggest potential error to pay attention to. With more experience, these difficulties become much less frequent. Going through surgical training requires learning multiple new things. If we are to keep pace with advancements in technology, that learning must continue through our careers. Nicolas Haden: The human-technology interface is potentially the weakest point in navigation, and optimising this will be a significant challenge for the systems going forward. The need for a reference array to be invasively placed is undesirable in minimally invasive cases. There are already some alternatives available, but I see this, along with active monitoring of the patient position and location, as likely challenges and areas for imminent development. Technological progression—particularly in the quality of intraoperative imaging—is happening at such a pace that, no sooner has a unit equipped itself, its “shiny, new” purchases are potentially out of date. Future-proofing to allow upgrades in an easy and cost-efficient manner will be highly desirable. At the moment encouraging and promoting the use of navigation amongst non-adaptors, and then supporting them in their progress through the learning curve, is a challenge facing the industry. One of the next challenges for us as surgeons will be ensuring that spinal surgeons of the future are adequately trained to undertake procedures with and without the support of navigation technology. Charles Crawford: Surgeons are accustomed to learning new procedures with new instruments and techniques—I do not think that navigation is that much more difficult, other than the fact that you do rely on radiology technicians, and others, in the operating room. The person using the system has to understand the potential ways that errors can occur, and try to minimise them. In my experience, Medtronic did a really nice job with providing support and training. Patrick Hahn: In addition, the system must take place without disturbing or restricting surgical workflow. Stefan Renaud: Currently all systems are limited to accuracy on an unstable spine only. The navigation is accurate only as long as the spine does not deviate from its position during the image acquisition phase. As soon as you put an interbody device or compress or distract a segment, the navigation is no longer accurate. Another image acquisition would need to be undertaken at each change. Technology that will allow dynamic feedback will allow entire procedures—from start to finish—to be done under navigation. Charles Crawford: Another issue, nowadays in healthcare, is cost. Justifying the increased cost is something that we all have to pay attention to. But, doing surgery in a safer and more accurate way can potentially decrease cost as well—we just have to prove that to the stakeholders. 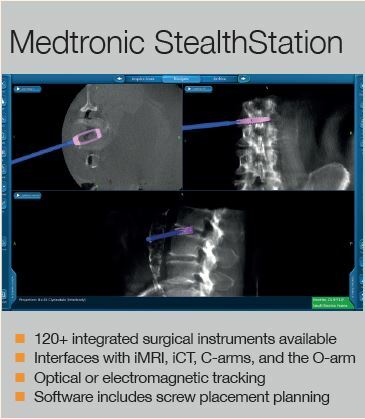 Charles Crawford discusses his experience with the Medtronic StealthStation, which offers the largest range of surgical instruments, each viewable in real-time onscreen. Charles Crawford: The StealthStation uses an intraoperative computed tomography (CT) machine to gather images, which it transfers to a computer. A camera-type device can see where the surgical instruments are positioned in space relative to the patient’s body, and that helps us to see the things under skin, muscle or bone during surgery. What is your experience of the StealthStation? This is something I was introduced to over seven years ago. I have, over time, become more and more comfortable operating with it at my hospital. I have come to trust the system, and to see new applications for it. Because of this, my usage has increased significantly over the years. What are the key benefits of this system? You can do intraoperative CT scans with this system, which gives us a significant amount of information about how the patient is positioned during spine surgery. We can also re-image the patient during surgery, if this becomes necessary—I really like this feature. Because Medtronic makes surgical implants and instruments, they have coordinated the navigation system with their products. This means that you can actually look at the size and the shape of their instruments and implants intraoperatively, and you can customise them for the patient. We primarily use the system to place bone screws in the spine, which can be planned using software. We can fit the perfect size screw to the patient’s anatomy using the navigation system. The system is also portable, so we can take it from one operating room to another easily. This way it is possible for multiple surgeons to use it in different locations at the same hospital in a single day. Nicolas Haden: I use a single-screen Curve platform, consisting of camera, workstation and screen, with 3D and MRI/CT merge software, used with an Arcadis 3D C-arm for intraoperative imaging. The navigation application can be used either with surface registration for open surgery, 2D registration, (both using preoperative CT) or 3D intraoperative imaging. The latter facilitates less invasive approaches and percutaneous introduction of instrumentation, allowing navigation on the acquired images or following merge with a preoperative CT. The benefits of using imaging acquired in the operative position are particularly apparent with unstable fracture surgery, as well as in the very mobile cervical spine. My practice and experience with the application has changed over the last few years, as I have gone from having to rely on surface matching and occasional 2D matching with open cases, to being able to deliver far less invasive approaches and percutaneous instrumentation with the intraoperative use of 3D imaging which—wherever possible—I merge with preoperative CT to enhance image quality, or MRI to guide decompressive or resection surgery. My practice—which is delivered in a tertiary neurosurgical and major trauma centre—involves the full spectrum of urgent tumour, trauma, infection surgery, as well as intradural tumours, and degenerative whole spine pathologies. I now use the navigation applications for all cases where instrumentation is to be placed, or where tumour resection benefits from the kind of accuracy that I would have desired in cranial surgery—eg. nerve sheath tumour resection in the cervical spine where the vertebral artery is in proximity. My default is to use navigation and to not do so if there is an active reason not to. Why do you use this system? As a neurosurgeon, my first exposure to Brainlab was in cranial surgery, and for this reason alone I had a leaning towards that product rather than its competitors. In the early days, I think spinal navigation products lagged behind their cranial counterparts significantly. Brainlab seemed to overcome the technological problems more effectively than their competitors. The software and camera technology for the most up-to-date version of the spinal package is so far ahead of what it was, and is as accurate and reliable as the cranial version which I have long been comfortable to rely on. The current system is user-friendly and in the main very intuitive, which avoids the highly undesirable trawling through manuals to optimise use! Brainlab has been particularly responsive to feedback and looking at future avenues for development which is definitely highly desirable in any product as a surgeon you chose to use. Have you experienced any problems with the system? In several years of use I have had only two cases where the navigation accuracy was lost, and I had to resort to traditional imaging techniques. In one of these cases it was not until after erroneous placement of a pedicle screw that this became obvious, which potentially reflects the weakness of technology and human interface. The patient came to no harm, but the problem was probably movement of the reference array. Otherwise, having overcome persuading the NHS to fund investment in the technology, the only problems have been riding the learning curve and, in the early days, facing the inevitable extra effort and time require to do this. As we all know “taking the whole team with you” when using any kind of new technology or procedure can be challenging, although ultimately rewarding and exciting. The Fiagon system uses electromagnetic technology for pedicular navigation. Patrick Hahn, who has used the system for three years, discusses his experiences with the product. Patrick Hahn: The Fiagon system uses an electromagnetic field (EMF), which is generated to detect instruments in a three-dimensional operative area during procedures. The system continuously tracks the instruments and the patient’s anatomical structure. It can correct static errors using special calibration and correction methods, taking errors attributable to the position and alignment of the navigating instrument into account. This leads to improved position precision in the working area adapted for the application. A special field generator is placed under the patient. The instruments used are equipped with signal coils positioned inside the tips. To match anatomical structures, a patient localiser is attached to the spinous process of the vertebral body to be instrumented. This localiser can be detected in the magnetic field. e screw length needed. The SpinePointer can be used to probe the pedicle in order to detect and visualise malpositions and injuries to the surrounding cortical bone. All instruments used are comparable with the standard instruments for spine surgery. Cannulated screws or K-wires are not necessary for procedures. A mapper cage is used for intraoperative 3D registration. This allows for a quick intraoperative registration of patients with all standard 3D C-arms or mobile CT-scanners in patients without preoperative scans. The easy handling of the system, the intraoperative matching, and the nearly unchanged surgical procedure for the surgeon. The reduction of intraoperative exposure to radiation for the surgeon and the entire surgical team is another advantage. Navigation is carried out virtually, in real-time, in a 3D data set. An exact intraoperative assessment is therefore possible in all planes, without changing or affecting normal standard procedures. Automatic registration means that no preoperative CT scan is required. The intraoperative multiplanar visualisation in real-time also provides a considerable advantage over 2D visualisation with a fluoroscopic data set. Clinical results, too, demonstrate a highly accurate technique for pedicle screw placement. In addition, due to the positioning of the patient on the field generator and matching using a minimised patient localiser, there are no components of the navigation system that interfere in the surgical site. The surgeon’s workflow is not disturbed. The Fiagon electromagnetic tracking technique is free of line-of-sight issues and allows navigation at the tip of a surgical instrument. Another advantage of EMF navigation compared to other navigation systems is the position of the reference coil near the tip of the instruments, which can result in lower torsion errors. 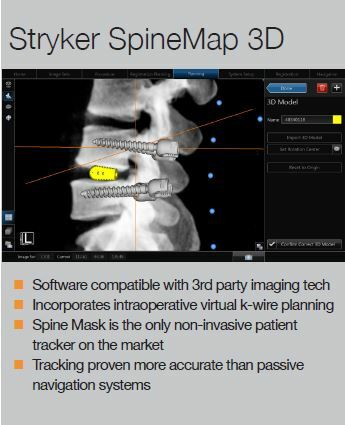 Stryker’s SpineMap 3D technology is designed for use with the NAV3i platform. It incorporates a non-invasive tracker (SpineMask), which is the first of its kind on the market. Stefan Renaud speaks to Spinal News International about the technology and his experience using it in practice. The Spinemap software allows you to take intraoperative 3D images—with or without merging them to prior CT or MRI images—to plan and to execute surgery. You can plant size and placement of screws preoperatively, or you can place virtual screws or trajectories intraoperatively. Although its benefit is maximised in the placement of hardware such as screws, the software can be utilised for simply approaching and docking retractor systems without exposing the surgical team to radiation. Spinemap allows multiple views and manipulations of the images to provide complete visualisation of the spine. I have done 50 or more cases with spine map, and have found the ease of use and accuracy to be excellent. I believe it offers more versatility and hence utility compared to some competitors. What is your experience with the SpineMask tracker? Spine Mask tracker is a huge leap forward in the ease of the navigation systems. It allows for open or percutaneous surgery with minimal change in surgical flow. Gone by the wayside are reference pins and arrays that cannot be blocked, dirtied, or touched for fear of malfunction. The tracker is what pushed me to using navigation as the default for all posterior instrumented fusions. As I practice almost entirely minimally invasive spinal surgery at my centre, I have used a lot of fluoroscopy. Navigation has let me almost entirely eliminate fluoroscopy. The standout part of this system is the Spine Mask. I cannot overstate the increased ease enabled by this piece of the platform. Moreover, the system overall is more versatile than others. For instance, in a typical minimally invasive transforaminal lumbar interbody fusion case, we have to place screws, do a decompression, discectomy, place the interbody, bone graft, and lastly place rods. You can perform these in a different order, but all surgeons must accomplish every step to have a successful surgery. Most systems only allow for placement of screws. Everything else has to be done via an open none-image guided technique, or you have to resort to intraoperative fluoroscopy. The Stryker system also allows you to position and monitor progress of decompression. 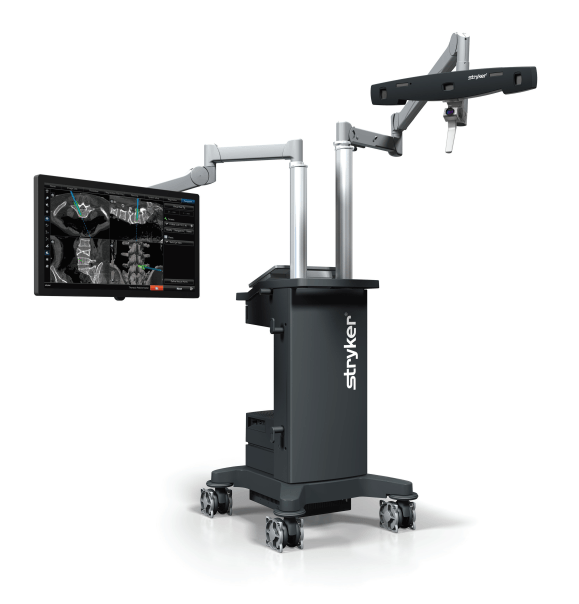 From a systems standpoint, the Stryker navigation platform can work with multiple image acquisition machines (O-arm, Ziehm, Siemens Arcadis, etc), and can be adapted or attached to any hardware company. So, again, versatility is great. Have you experienced any problems using this system? Like any system there are some nuances. Once interbody work begins, the vertebral segments are mobilised, and navigation thus loses its accuracy. I believe in the near future this limitation will be rectified. I recommend using the 90 view to see down the instruments path. Allow the quick needle to “settle” to get more accurate positioning. Overall, I have been very happy. Only on one or two occasions have I had any question of accuracy, which I have been able to solve by reacquiring images. Image acquisition takes us a total of five minutes, with the “spin” during which images are taken and stored taking only one minute.